Could Hillary Clinton Team up With Mitt Romney to Steal the Presidency From Donald Trump? Establishment figures have spent the last 18 months trying to cook up schemes to deny Donald Trump the Presidency. Now their last chance rests with the Electoral College. 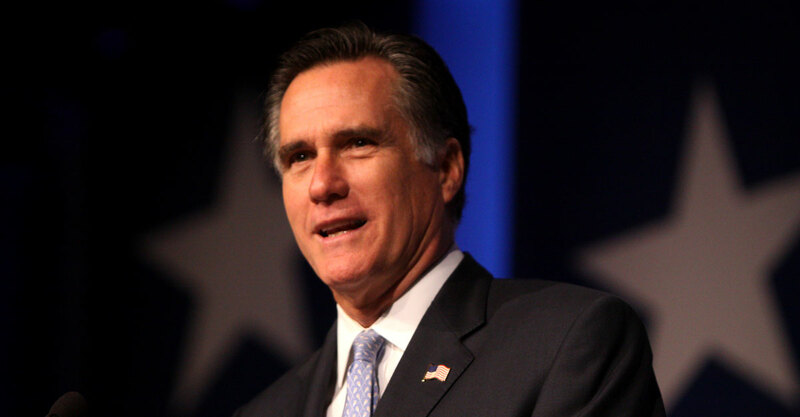 And the latest plot comes down to a corrupt bargain between Hillary Clinton and Mitt Romney. In order to stop Donald Trump from officially becoming President, opponents would need to deny him an Electoral College majority. Since he won 306 Electoral College votes, anti-Trump forces would need to convince 37 Republican electors to switch their votes. And already there is a vicious campaign underway to pressure Republican electors to change their votes. Supporters of Hillary Clinton have issued death threats, as well as harassing emails and phone calls, in an outrageous attempt to swing the December 19th Electoral College vote. So far, neither Hillary Clinton nor her allies have spoken out against the intimidation tactics, which leads many to believe she is either behind the effort all together or supports the last ditch plan to swing the election. But is there a way the establishment could still deny Trump the Presidency and install one of their own in the White House? Writing in the Washington Post, Michael Cannon says there is a way for elites to prevent Trump from taking the Oath of Office. However, it would involve a compromise between Hillary Clinton and Mitt Romney. “The only way Democrats stand any chance of persuading Republican electors to abandon Trump is with a dramatic gesture of true bipartisanship. If all 232 Democratic electors pledge to reach across the aisle and vote for a Republican alternative to Trump, it would take just 38 GOP electors to make that person the next president. In the event that neither candidate receives an Electoral College majority, the election is thrown to a vote in the House of Representatives. House members would then vote for one of the top three finishers in the Electoral College. Could the elites enter into the ultimate corrupt bargain to stop Trump? The odds are stacked against it. Trump won the election fair and square. He also won with a decisive Electoral College majority. If the election were thrown to the House and the Republican majority elected someone other than Trump, GOP voters would be outraged. A vote for someone other than Trump would virtually guarantee a primary challenger. Like all of the #NeverTrump fantasies, this one has no basis in reality. Next ArticleDid Joe Biden Just Announce he Would Run Against Donald Trump? All American hating politicians should be shoot for treason, murder, grand theft, the list is long. IT WOULD NEVER , EVER ; ‘WORK’ THEY//BOTH WOULD BE A DESASTER TO AMERICA. Why do you think Trump is keeping Romney on the Secretary of State string? In any case the odds of pulling this off approach zero. If they were to be able to do that, it should cause another CIVIL WAR! That would be the most criminal act Hillary has ever done in her life! Go ahead pull some back room deal crap and see what happens The silent Majority will revolt and hang all of you from the trees in your own front yards. You want to start a revolution you do some stupid crap like that. We are armed, we are ready. Just give us a good reason to hang your asses. This not a threat its a promise. My thoughts exactly, Brad. If they think we are pissed now, just try this crap. It will for real be pitchforks and torches. She is capable of any thing and Romney is certainly a power hungry little scum bag and also capable of any thing. They have both shown their true colors this year and they are both little scum bags. If your “god” is in control, Obozo would get a third term: It would be the same “god” who was in control in 2008. . .
GOD is in control but we have to play our part! Any member of the electoral college who decides they want to ignore the decision of the voters of their state and support anyone other than the choice of those voters will spend their few remaining days in hiding, looking over their shoulders for the inevitable wrath of the Americans they betrayed. There will be no mercy for such a traitor. They will be hung in public and their families will be hounded so that they will never know peace again. Anyone thinking being a part of such a conspiracy would be worth it should think carefully of how betraying millions of angry Americans will impact their lives. Dangerous thinking! Another Civil War would be a bloody mess! If the EC went against the people’s vote likely the Congress would decide the vote and wisely install Trump! No, then you’ll have two women running this country. You know, I almost NEVER name call. However, I will make an exception, in your case. YOUR comment IS SEXIST. Two women, running this country is NOT the problem. THESE two, would be the problem. Gee, that’s very sexist of you to say that. Ironic, on the same page as this distasteful story, there’s a picture of Colin Kaepernick! Made me wonder who was worse, him or anyone plotting the Trump takeaway! This is BS: Most of Hagllary electors are in states with laws against “Faithless Electors”. In most of those states if the Elector does not follow the popular vote, he gets fined, removed and replaced! Besides, a stunt like that would send all M82 Barrett owners to the rooftops. . . I think hillary and romney would do much better for the country as cellmates instead of govt employees…one thinks he is king, the other thinks she a queen, and both, combined, are of no good use at all to anyone in america.. I DONT THINK SO. WHY TRY AND SCARE THE PEOPLE. POLITICIANS HAS USED SOCIAL SECURITY TO SCARE OLDER AMERICA FOR YEARS. WE ARE FED UP WITH IT. PUBLIC LAW 414, CHAPTER 2, SECTION 212 WAS PASSED IN 1952 BANNING ALL MUSLIMS FROM THE USA. SINCE OBAMA HAS DECLARED ON WORLD WIDE TV THAT HE WAS A MUSLIM, EVER ORDER HE HAS GIVEN AND ANY LAW HE HAS SIGNED IS ILLEGAL. ALL TRUMP HAS TO DO IS ORDER THE LAW ENFORCED TO DEPORT ALL MUSLIMS. NOW GOOGLE THE NEW CLINTON CHRONICLES 2015, LISTEN TO ALL. SINCE HUMA WAS FROM A RADICAL FAMILY, PLUS, OBAMA HAS SURROUNDED HIMSELF WITH SEVEREAL MUSLIMS, YOU WOULD THINK THAT THE MUSLIM WORLD HAD A PIPE LINE TO WASHINGTON. RELEASE OF THESE EMAILS WAS TO INFORM THE AMERICAN PEOPLE. I would like to see what happens if THE WILL OF THE PEOPLE is overridden? I believe if this occurred there would be world war three declared between the Republicans and Democrats! What an insanely horrible thought!! Romney is stupid and Hillary is a should be lock up! This would tear this country apart. She lost the election. There is nothing worse than a woman scorned! She is perfectly willing to to shred this country to get her way. She is the most disruptive woman in politics today. Hitlery Rotten Clinton is a washed up old hag and had been since birth. The interesting fact which surfaces is that the old bag is the darling of old hags. Check out her avid supporters. The wrinkled faces and ballooning guts tell it all. While contemplating Hillary Rotten as president they fill their already thickened guts with Twinkies and other angst satisfying junk foods. They are their very own best supporters. One good thing is that this diet will insure their rapid demise.